35% of throws behind or within 5 yards of the line of scrimmage. 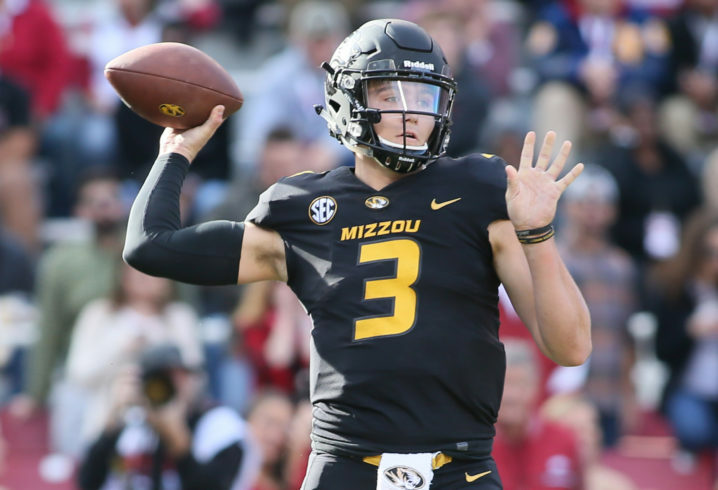 Impressions: Drew Lock is an experienced player. He’s a big framed, athletic, pocket passer that is able to create and extend plays while being able throw on the run. There is a strong narrative he misses easy throws- and he will miss them – but not like Josh Allen missed them. Not outside an acceptable level of missing them, except the Alabama game, so maybe that’s where it came from. He is able to produce a high velocity throw with minimal effort and throws pinpoint dimes downfield at a very high level. If he really uncorked it, I would not be surprised to see 70-plus yards. His fundamentals break down in the face of interior pressure (backpedals and as a result throws off back foot) but steps up away from edge pressure (doesn’t look to flee). Can throw from all arm angles, however this leads to a higher percentage of batted passes. He has moxy to his play and his leadership qualities are obvious. His supporting cast at Missouri, especially the defense, put his team in tough spots that forced Lock to play aggressively to keep the team in the game. Lock is extremely safe with the ball – the best in the class at keeping it out of harm’s way. I see a relatively safe player. With his physical tools, he can succeed in the league even without taking a huge leap developmentally. If he can take that step, he has elite talent to be a top 5 player at the position next level. He is a great anticipatory thrower. He routinely decides to throw well before his guy is open. He sees where coverage is and anticipates where coverage will be and lets it rip. He hits more cover-2 hole shots and downfield back shoulder throws than anyone in this class, which takes high level arm talent, anticipation, and confidence. These throws are game changing. 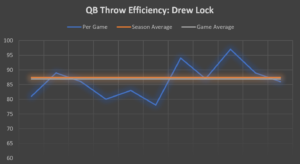 Overall, Drew Lock has all the tools and physical traits you want in a franchise quarterback in today’s league. He needs to clean up his game overall, but is a relatively safe pick worth drafting top 10 overall.